President Rodrigo Duterte’s marching orders are clear: Stop contractualization! No agency hiring! 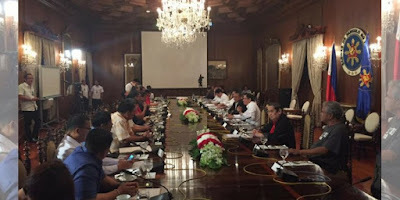 Labor Secretary Silvestre Bello III received these marching orders from the President during the labor dialogue last Monday. He was instructed to work on a new draft Department Order and to address the related plea of PALEA on outsourcing. “As the alter ego of the President, Sec. Bello is hard pressed to comply with the order and to abide with the demand of workers without further delay,” said Nagkaisa spokesman, Rene Magtubo. Through a symbolic pressing of time button, the group declared a 30-day countdown for DOLE to come up with new rules prohibiting contractualization. The group noted that the latest draft of the issuance, distributed in January, still reflects the DTI and employers formula of legitimizing manpower agencies and regulating their practices. “In the light of the President’s latest instructions, Sec. Bello should junk this draft and instead adopt Nagkaisa’s proposed DO, which seeks prohibition of contractualization, as the new working draft,” added Magtubo. On orders of the President, Sec. Bello is to convene the Tripartite Industrial Peace Council (TIPC) to discuss the new draft order. The TIPC, composed of workers, employers and government representatives, serves as the clearinghouse of all labor polices, with the power to endorse proposed issuances to the DOLE Secretary. “Should there be another deadlock at this level, we expect the Secretary to decide along the line of prohibition agreed upon at the Palace,” stressed Magtubo. The coalition is likewise hopeful that HB4444 authored by Rep, Raymond Mendoza of the TUCP Partylist, which seeks total prohibition and criminalization of contractualization offenses, will gain ground in Congress once certified by the President. Once contractualization is finally prohibited, the rights of workers to security of tenure, to unionize and bargain collectively will be restored. However, Magtubo called on workers to continue working together and be vigilant as the enemies of the working class will surely find ways to prevent workers from achieving total victory against contractualization and other forms of exploitation. Women make up more than half of contractual workers. Hence, led the Women’s Committee of Nagkaisa, women workers will continue to exert pressure on the DOLE to stop contractualization. While calling for a stop to contractualization in civil service, public sector unions has also secured a commitment from the President to ratify ILO Convention 151. According to Annie Geron of the Public Services Independent Labor Confederation (PSLINK) which is affiliated with Public Services International (PSI), Convention 151 is an international labor standard that recognizes the rights of public sector workers to freedom of association and collective bargaining.